I only have one photo today of our lunch. Although I’m using it twice. I took several but evidently something happened between taking them and saving them. When I went to upload, all were just plain white, except one. With all the positives of fantastic technology, also come a few negatives. The fish was fantastically flaky and delicious. I’m sorry you had to miss it! My husband has a huge aversion to oil. He hates greasy food and particularly liked this fish because “it gives you the sense that you’re eating something fried but it’s not overly oily”. I would have to agree with him. This meal feels like you’re really indulging, but in reality, it’s all baked and has very little fat. What fat it does have are pretty healthy fats; the mayo is even made with olive oil. It feels like we’re finally settling in to our new home and getting into somewhat of a routine. The one thing we can’t seem to acclimate though, is dinner time. We’re hungry for breakfast a later time than usual, then end up missing lunch, and are ready for dinner around 2:30. That would be 11:30 Washington time, which I guess is actually lunch… See what I mean about time acclimation? Amazing how firm our inner clocks are set, isn’t it? This is why it appears that we are having dinner for lunch…because we are. It’s probably better that way anyway. Then we aren’t full when we go to bed and we can have dessert for dinner. See how that works out so nicely? Yay! For those of you who are visiting for the first time, in November we moved almost 3,000 miles away from our home town in Washington State to southern New Hampshire. We love the new house, the neighborhood, the surrounding area, and the abundance of fresh seafood. I’ve probably eaten more mussels and clams in the last three months than I have in my entire life. But I would have to say that the people of New Hampshire are what really have made all the difference and have taken the sting out of what would normally be a rather stressful experience. They are just so nice. I know it sounds odd, and maybe even kind of dorky…and you may think I’m exaggerating, but I kid you not. In the three months we’ve been on the east coast, I can say I have not seen one person in public be rude to another person, I haven’t seen anyone flip each other off in their cars or yell, people actually stop for you to cross the street whether you’re in a cross walk or not and they don’t get angry about it, and they don’t invade your personal space at the check out stand (all things that happen frequently in our home town). They stop and talk to you and shoot the breeze as if they don’t have any thing better in their day to do than really chat with you and find out how you’re doing. And they are incredibly patient people. And these are the strangers, people we don’t even know! Just a few days ago I stood in the gluten-free isle at Hannaford’s and talked to a couple from Massachusetts for about a half an hour (we’re only a few miles from the border). The wife has Celiac and the husband does all of the cooking for her. I would say they were in their early 60’s. They were shocked to hear that we love the east coast so much and when I told the husband that I was amazed by how genuinely friendly people are, the man was taken aback and thanked me and told me that he considered that quite a compliment. Moving almost 3,000 miles across the country and starting a new life in our mid 40’s has been an adjustment to say the least. But it is also a fantastic adventure and I’m incredibly thankful we were smart enough to set all the “what-if’s” aside and take the leap! You’ll want to start prepping the sweet potato fries and sauces about 40 minutes ahead of baking the fish, which only takes about 20 minutes to bake. If you like an even spicier sauce, add Sriracha! Preheat oven to 425 degrees. Line a baking sheet with parchment. Toss the sliced sweet potatoes with olive oil or avocado oil and season with sea salt and garlic powder. Line them on the baking sheet with room in between so they crisp nicely. Bake for about 25 minutes or until edges are browned and fries are firm on the outside. Remove the skin and bone from the halibut if necessary, this will leave you with four pieces. Dry each one off with a paper towel and set on clean paper towels. Place the bread crumbs, salt, oregano, and garlic powder in a shallow dish and stir with a fork until completely combined. Set aside. Melt the butter and olive in a shallow dish in the microwave for about 30 seconds, not until it’s boiling, just melted. Line a baking sheet with aluminum foil and top with a cooling rack. Take the fish and roll it in the butter, then roll and cover completely in bread crumbs. Set on rack and repeat until all of the fish are dipped and covered in bread crumbs. Next, take any remaining butter and olive oil mixture and drizzle it with a spoon over the breaded fish. Sprinkle a little more bread crumbs over the top. Bake in preheated oven for 15-20 minutes. Don’t over cook or the fish will become rubbery. You want it to flake nicely with a fork. Serve with the sweet potato fries, lemon wedges, and a dollop of both dips. 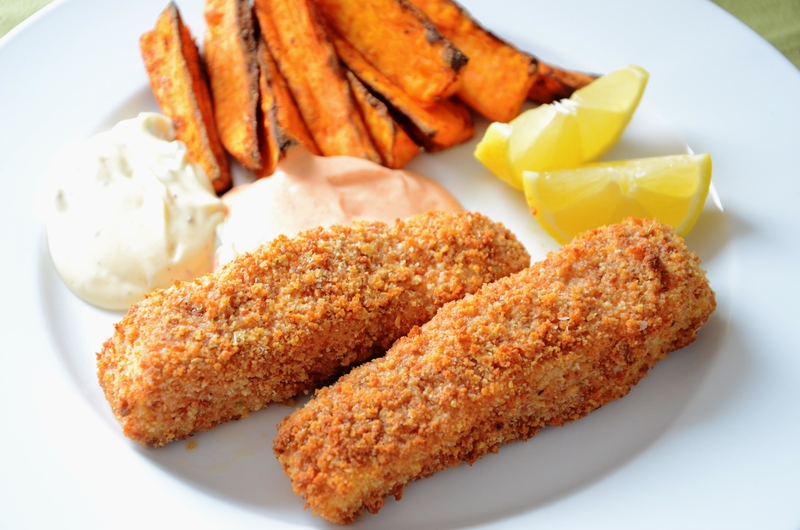 Mmm I love baking fish, easy to clean up and way healthier than deep fried ones. Yours look really delicious! It will be an exciting few months for you, April. With Winter ending — it will, you know — and Spring taking over the landscape, you’re in for a real treat. With scenery so beautiful in Winter, it must be incredible in the Spring. That’s a nice breading for your halibut and that meal looks delicious.